This lovely porch for a house in Westcombe, Somerset was recreated using reclaimed sections of wrought iron with cast iron detailing. 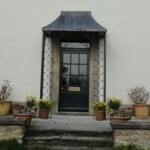 The porch was finished with a new lead roof by local lead-working firm Galena. 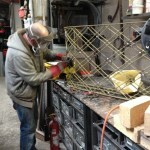 Galena have a high level of expertise and come highly recommended by all of us here at Ironart of Bath – these guys don’t have a website but are at: 14 Bakers Corner, Neston, Corsham, Wiltshire SN13 9SY 01225 811816. If you have a similar project in mind, we’d love to help so please get in touch. Martin restored two really pretty Georgian balconettes a few weeks ago. These balconettes were situated on the back of a house in St James’s Square in the centre of Bath. I’ve posted the full project on our website – CLICK for a link to take you to that area of our site. We’ve also made a short film showing Martin in action lead casting in the Ironart workshops – so if you’d like to see how it was done… CLICK to take a look.